Cats can have all different kinds of personalities. Some are outgoing, dominant, cuddly, or attention-seeking, while others are nervous, shy, and sometimes even scared of people. For cats who are scared of people, daily visitors to their home can cause extreme stress, but thankfully, this is something that can be overcome. Like people, cats are born with their given personalities, but the environment they grow up in can bring out certain character traits, especially if the environment is not a good one. Socialization as a kitten is one of the most important determining factors in developing a cat's personality and the behaviors it exhibits. For example, kittens who are bottle fed, exclusively cared for by a human and never exposed to other cats may not know how to react normally to other cat mannerisms. They may have problems interacting with other cats throughout life because of this. But kittens who have the opposite experience and are never handled by humans during the first few months of life can have issues interacting with people. A fear of people is often seen in feral cats who live outside and have little to no human exposure. If a cat is naturally more dominant, the lack of human interaction may contribute to that cat being aggressive towards people. If a cat is naturally more submissive, it may be scared or people and simply run away from them if it did not grow up around them. Aside from not having been exposed to people or properly socialized, cats may be fearful of humans for other reasons. Sometimes cats are scared of people because they have had a bad experience with a human. Unfortunately, not all people are kind to animals and may intentionally hurt a cat, which often results in a scared feline. Other people, such as veterinary staff members, may unintentionally frighten or stress a cat out during a routine visit, which can also cause a cat to develop a fear of people. Bad experiences with people or a lack of exposure to people, in general, are the most common reasons why cats are scared of people. If a cat has developed a fear of people in its own home, it may be due to an excessively noisy visitor–someone who accidentally startled it, or even someone who taunted it while visiting or through a window. If a cat in pain, such as one with arthritis or a wound, has been picked up and accidentally hurt by an unknowing visitor, it may also hide and develop a fear of people. This fear of people is a defense mechanism that a cat may unfortunately develop, but it is designed to protect the cat from future harm. Expose your cat to other people and cats while they are young. This exposure is often referred to as socialization and it will teach your cat that different cats and people are nothing to be scared of but instead are part of a normal life. If possible, expose your kitten to people of all shapes, colors, and sizes. Children, senior citizens, men with beards, women who wear a lot of perfume, people of varying skin colors, and other people all smell and look different and may unintentionally startle your cat if it isn't used to these variations in humans. It may be a slow process, but you can teach a fearful cat to no longer be scared of visitors. Many of the same techniques used to help prevent a fear of visitors are useful in overcoming a preexisting fear in a cat. Treats, verbal praise and petting, pheromones, supplements, and encouraging your visitors to be quiet and slow-moving will all help show your cat that there is nothing to be afraid of. 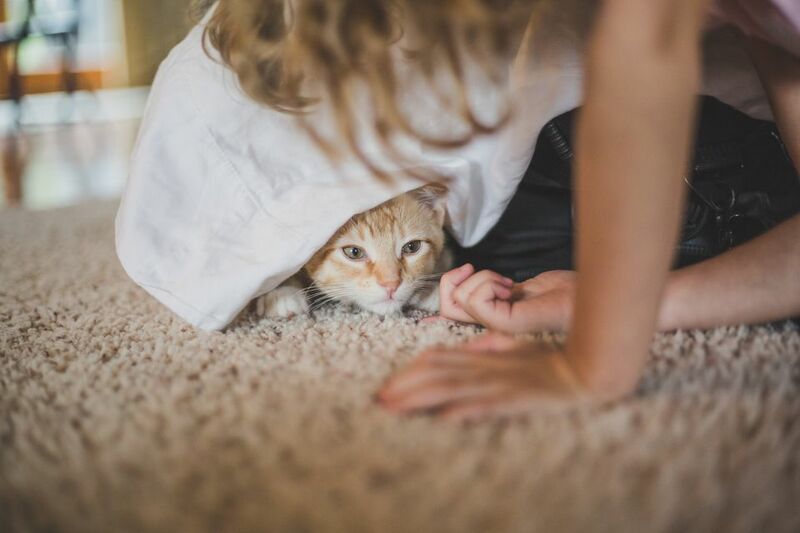 Allowing your cat to come out from hiding instead of forcing it out is helpful. Visitors that stay for an extended period of time may have a better chance at having your cat warm up to them since the cat will have more time to get used to them. Having frequent guests instead of one or two visitors a year during holidays will also help recondition your cat to know that visitors are not scary since it is a regular part of life and not something new or unexpected.